"Mr Glendenning says he has documented the deaths of nine of the rejected Afghans at the hands of the Taliban, but he believes the figure is actually 20." "Of the other Afghans who returned home, many are hiding in Pakistan, or are forced to move between Pakistan and Afghanistan to evade the Taliban. They include a man whose two daughters were killed in a Taliban attack on his family's home near Kabul, after his asylum claim was rejected by Australia in 2002." Every year, thousands of people flee their homelands to escape war and persecution. The people who make it to Australia end up in detention centres while their claims for asylum are processed. This can take months, if not years and can lead to a sense of profound uncertainty. The Australian Government eventually sends back asylum seekers it doesn't think are refugees, and who can't prove they have "a well-founded fear" for their safety. 11 July 2005: David Corlett, Following them home: The fate of the returned asylum seekers - "One of the things that I found that was almost universal was that the implications of Australia's detention policies continued to affect people's lives as they had been returned ... They spoke of, as a result of Australia's asylum seeker policies, of losing their dignity, of having lost their humanity, and they also spoke of being institutionalised in Australia's detention regime ... There was a couple of instances in Iran of people who had been sent back with documents that put them at risk, and they were interrogated as a result of those documents." "We will decide who comes to this country and the circumstances under which they come"
John Howard's notorious 2001 election speech summarized his government's policy on asylum-seekers. Asylum-seekers were held in detention and if their refugee status was declined, they were often deported. A Well Founded Fear follows Phil Glendenning from Sydney's Edmund Rice Centre for Justice as he tracks down several deportees to find out how they are faring. He talks to an elderly Afghani woman whose son was detained on Nauru for 18 months before being sent back; he went missing shortly after his return. Detainees returned to Damascus were arrested and taken to a secret police facility. There are many such stories in Anne Delaney and Bentley Dean's hard-hitting, yet intensely moving production. Everyone should watch this documentary. It explains how harshly people seeking asylum have been treated and how Australian Governments have too often returned, what they regard as failed asylum seekers, to situations of very real danger. When will we again find our humanity? Sometimes I feel ashamed to be an Australian. Watching A Well Founded Fear is surely one of those times. How could we have allowed this to happen? We all bear an immense personal responsibility, moral and legal, but no one so much as those who lead our nation in these inhuman policies. This documentary should lead us to two commitments. First, in spite of the policy changes under the Rudd government, we have not yet begun to make up for the profound harm we have caused. We must do that. Second, we must never allow this to happen again. Never, never, never. THE Immigration Minister, Chris Evans, has demanded answers to allegations up to 20 Afghan asylum seekers rejected by Australia under the Howard government's so-called Pacific solution were killed after returning to Afghanistan, and others remain in hiding from the Taliban. The claims are contained in a documentary to be aired on SBS on November 19. The film, A Well-Founded Fear, produced by Anne Delaney, is based on the efforts of Phil Glendenning, the director of social justice agency the Edmund Rice Centre, who has spent the past six years tracing many of these rejected asylum seekers. About 400 Afghans detained on Nauru were returned to Afghanistan after having their asylum claims rejected. They were told by Immigration officials it was safe to go home, and that if they refused, they would remain in detention forever, according to accounts given to Mr Glendenning. Another 400 who refused to go voluntarily were eventually found to be refugees and were resettled in Australia or other countries including New Zealand. Mr Glendenning says he has documented the deaths of nine of the rejected Afghans at the hands of the Taliban, but he believes the figure is actually 20. Of the other Afghans who returned home, many are hiding in Pakistan, or are forced to move between Pakistan and Afghanistan to evade the Taliban. They include a man whose two daughters were killed in a Taliban attack on his family's home near Kabul, after his asylum claim was rejected by Australia in 2002. Senator Evans told the Herald he had asked his department to give him a "full briefing" on the matters raised by the Edmund Rice Centre. He said the department's initial response, "and I am conscious this is the department's response - is that they don't agree with a lot of the claims made". But he said he was "taking the claims very seriously" and had "asked for further information about the processes that occurred on Nauru and the robustness and integrity of those processes". Much of the information Mr Glendenning used to locate the rejected asylum seekers was provided to him by sympathetic Immigration officials, concerned at what had occurred under the Howard government. He believes the Afghans who left Nauru were "lied to" by Australian officials, and he wants the Government to reopen their cases. "We now have the opportunity with the new Government to put the mistakes of the past to rest," Mr Glendenning said. Senator Evans said he had an open mind about reopening some of the cases. It would be a big step, he said. "You would want to be convinced there was something very wrong that occurred. "What some advocates are saying is you ought put them [the rejected Afghans] as a priority in the humanitarian intake over the claims of others. The reason for that priority is that they once came to Australia, were rejected as refugees, and returned to their country of origin," he said. This would "fundamentally overturn" the basis on which such decisions were normally made, which was on priority of need. Philip Ruddock was immigration minister until October 2003. Asked for his comments on the rejected Afghans, he said, "I would never say mistakes are impossible." But he added that Australia's asylum system was "robust and credible". He also said the Afghans left Nauru "voluntarily". "It is the case that Afghanistan is a dangerous place but the [United Nations] Refugee Convention does not say you cannot be returned to a dangerous place," Mr Ruddock said. "The fact that somebody might tragically die [in Afghanistan] may well be as tragic as a road accident in Sydney." AN AFGHAN asylum seeker rejected by Australia under the Howard government was tortured and beheaded by kidnappers less than four weeks ago in a province south of Kabul. The man, Mohammed Hussain, was thrown down a well by gunmen, believed to be the Taliban. Then in front of onlookers including members of his family, the killers threw a hand grenade down the well and he was decapitated. Accounts of the killing were given to Phil Glendenning, director of the Edmund Rice Centre, this week. He told the Herald he has verified the events with four different sources in Afghanistan. Mr Hussain was a self-described poet who was detained on Nauru by Australian authorities under the Howard government's so called "Pacific solution". But his claims for asylum were rejected by immigration officials and he was sent back to Afghanistan. Mr Glendenning met Mr Hussain in January in Kabul, where the Australian was filming a documentary, A Well-Founded Fear, about asylum seekers rejected during the Howard years. Mr Hussain told Mr Glendenning he could not live in Afghanistan because of the Taliban and other factional enemies, and now lived in a place where there was a coal mine, "a mountain and no one else". Shortly after Mr Glendenning saw Mr Hussain, he learnt the Afghan had been kidnapped by gunmen in a 4WD vehicle with blackened windows. According to accounts given to Mr Glendenning, Mr Hussain was held for weeks by his captors before he escaped to Iran. After authorities began deporting Afghans home, he fled to Pakistan, but the Taliban forced him out and he returned to Kabul. It was from here he sent a message to Mr Glendenning, asking him "could I contact anybody that might be able to help him to get out of the country because he was going to be killed by his enemies from the Mujahadeen war". From here Mr Hussain fled south to the Afghan province of Ghazni, where again six weeks ago he was kidnapped by enemies believed to be the Taliban. Then 26 days ago Mr Glendenning says Mr Hussain's captors threw him down a well "in front of many witnesses including villagers and some family members". Says Mr Glendenning: "It further underscores the fact that the Pacific solution hasn't ended, and that those who were the victims of it remain the victims of it." Mr Glendenning wants the Immigration Minister, Chris Evans, to reopen the cases of the rejected Afghans "as a matter of urgency". He also wants the Government to "put in place processes and policies to make sure this never ever happens again". IN THE depths of the harsh Afghan winter early this year, Abdul Azmin Rajabi took an Australian with him on a pilgrimage to the graves of his two daughters. Mr Rajabi placed his hands on the snow-covered tombstones marking where his children now lie, and told Phil Glendenning, the director of the Edmund Rice Centre: "I put my life in danger to help my family, to help my children, but I couldn't." Mr Rajabi is one of 400 Afghans Australia rejected under the Howard government's "Pacific Solution". His story, along with many others, is told in a documentary, A Well-Founded Fear, to be screened on SBS next month. He had reason to fear the Taliban in 2001. His family had connections to the previous communist government, and as if this wasn't reason enough for the Taliban to want him dead, he had given up his Islamic faith and had married outside his tribal group. The Taliban came looking for him and captured his father, who refused to say where his son was. So he was beaten with electrical cords. "When he came home he was unable to walk or talk or sit," the son says in the documentary. "His entire body was blackened with bruises." He died two days later. So Mr Rajabi fled to Australia, leaving behind his wife and children, in hiding in Iran, waiting until they could join him. How his two young daughters came to be killed by the Taliban a year later is a tragic consequence of Australia's refusal to grant this Afghan father asylum when he came begging for refuge, say the makers of the documentary. The decision to embark on such a perilous journey to Australia, aided by people smugglers, was a hard one. "I consoled myself hoping that, although separated from my family, at least I would find a way to keep myself and my family alive," Mr Rajabi says. Mr Rajabi, a member of the persecuted Hazara ethnic group in Afghanistan, arrived on Nauru in late 2001, where his claim for asylum was rejected and he was given no right of appeal. He tells Mr Glendenning, whose search for rejected asylum seekers is at the heart of the program, that Immigration officials told him it was safe to go back. They offered to give him $2000 to return "voluntarily", or face indefinite detention. "They told us that even if we stayed there for 10 years we would never be accepted." So in late 2002 Mr Rajabi went back. Four months later he was at home with his family in a town outside Kabul when an explosion ripped through the walls and windows of his house. He describes in the documentary how first there was one bang, then another. Shrapnel tore through the window, killing his daughter Yalda. Rowna, his youngest daughter, died a few minutes later. It was a grenade attack, believed to be by the Taliban who, according to local medical authorities and newspaper reports, targeted the family. Mr Rajabi drops his head into his hands and breaks down, unable to go on. Today he lives with the remainder of his family in Pakistan, where he can't send his sons to school for fear of their safety. He only came to Kabul so he could tell Mr Glendenning, and Australia, in person, what happened to him. "We could only speak from our heart, which we did," he says of the account he gave to Australian officials seven years ago, but which they didn't want to believe. 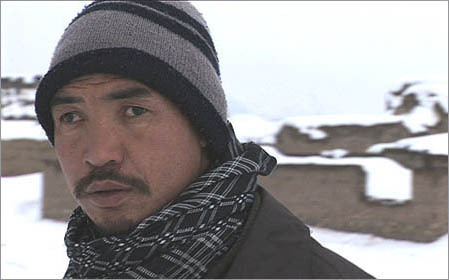 Mohammed Rizae is also a Hazara Afghan who was rejected by Australia. He believes this had something to do with the translators used by Immigration officials on Nauru who were all Pashtuns - the same ethnic group as the Taliban. He was too scared to tell the translators some aspects of his story, such as the fact he is Ishmaili, a member of the pacifist Islamic sect targeted by the Taliban and the nomadic Kuchis, who are also Pashtuns. Mr Rizae's grandfather had refused to fight the Soviet-backed communists. He was publicly hanged by the Taliban in a bazaar. But Australian officials told Mr Rizae there were inconsistencies in his testimony, and they were unable to substantiate his fear of persecution because Afghanistan was now safe. So in 2002 Australia sent him back to Afghanistan, where he was forced to flee to Pakistan because his old enemies returned to pursue him again. Today his province is in the hands of the Taliban. "Those places where we live are not and never were secure," he tells Mr Glendenning. Mr Rizae now spends his days moving between Pakistan and Kabul. Gholam Payador, also an Hazara Afghan sent back to Afghanistan by Australia in 2002, holds up a photo of himself and two other Afghans standing together on Nauru. The other men are now dead, he says. One was shot by two men on a motorcycle. Mohammed Hussain, another Afghan rejected by Australia, also meets with Mr Glendenning. "I was forced to leave this country, and seeking refuge in Australia worsened my crime," he tells him. A self-described poet who was working in a coalmine, he disappeared soon after he met the filmmakers. Eyewitnesses saw him taken out from his workplace by gunmen who put him into a 4WD vehicle with blackened windows. Mr Glendenning said he is still missing and there are grave fears for his life. Anne Delaney hopes her controversial documentary will make many viewers ashamed of being Australian. Or at least make them feel so embarrassed about the Kafkaesque treatment of asylum-seeking refugees under John Howard's so-called Pacific Solution that they put pressure on the Rudd Government to reopen the files of those who risked their lives to appear in her film. A Well-Founded Fear has already made front-page news. Immigration Minister Chris Evans demanded answers after learning of the documentary's claim that up to 20 asylum seekers rejected by Australia were killed after being sent back to Afghanistan to face the Taliban. "If we're going to make these life-and-death decisions," Delaney says, "we have to get them right." The film follows the travels of Phil Glendenning, who is the director of Sydney-based social justice body the Edmund Rice Centre. For six years, the passionate but soberly spoken Glendenning has travelled to some of the world's most dangerous hotspots on the trail of would-be refugees who were rejected by Australia. So far, his team has confirmed the fate of more than 250 returnees in 22 countries, including Iraq, Iran, Afghanistan, Sri Lanka and Columbia. Some rejected by Australia have been allowed asylum in New Zealand, Britain, the US or Canada. Glendenning's crusade was inspired by a simple question: how do the Australian authorities know they made the right decision when ruling particular asylum seekers could be returned safely to their country of origin if they never checked what happened to them afterwards? Delaney realised there was an important film to be made soon after being introduced to Glendenning in 2006. By then, Glendenning had presented his early findings to the Howard government, which had rejected them as baseless and inaccurate. To prove Glendenning's allegations one way or the other, Delaney's film crew would have to accompany him as he met returnees he had tracked down - in places such as Kabul in Afghanistan, Tehran in Iran and Damascus in Syria. The film was commissioned by SBS while Howard was still prime minister, a decision Delaney describes as "brave, given the political climate". But the Rudd Government had been elected by the time filming started last December (the delays were caused by Taliban offensives or the reluctance of the returnees to be interviewed on camera). Eventually, the delay worked in Delaney's favour. "Their attitudes towards going public clearly changed," she says. "I think they had just got so desperate. These people really wanted their story told. They wanted the Australian public to know what had happened to them." Glendenning says the film accurately reflects his work. Some 400 Afghans who were detained on Nauru were told by our immigration officials it was safe to go home. Of those his team have tracked down, "95 per cent are now living in danger", he says. The cruellest irony is that those who believed the Australian Government live in fear, while "those who remained in Nauru and did not believe what Australian officials told them are now living in Sydney or Melbourne". "I stood with one man in Kabul who knows that if he hadn't believed the words of the Australian Government, his children would still be alive today." Does Glendenning feel ashamed of what was done in Australia's name? "Yes. I feel the Australian people were sold considerably short. Not only were these [refugees] lied to, the Australian people were lied to by a government that decided to exploit vulnerable people for its own political advancement." But weren't we all complicit? Shouldn't we have asked more questions? Put the Pacific Solution under greater scrutiny? "I think that's right," Glendenning says. "But it goes primarily to leadership. These people jumped into fishing boats with their pots and pans. "They weren't terrorists. Terrorists travel first class." Arguably the film's most shocking revelation is the plight of the biduns born in Kuwait who arrived in Australia without passports because they are officially stateless. To be rejected, they needed travel documents - otherwise, they couldn't be sent to a country willing to accept them. The film claims some were allowed to leave Nauru on documents Australian officials knew to be false. Others were issued with six-month visas to Syria, a country with an appalling human rights record, described by President George Bush as one of the four rogue states in his "Axis of Evil". Once the visas ran out, they were liable for arrest. "Why Syria?" Delaney asks. "Some questions need to be asked." The Australian government today said it would investigate reports that up to 20 rejected asylum seekers from Afghanistan were killed after being sent back. Under the former government of John Howard, about 400 asylum seekers were denied entry to Australia after it was deemed safe for them to return home. Their fate was traced by the Edmund Rice Centre humanitarian agency, which says it has documentary evidence that nine were killed by the Taliban. The organisation estimates a further 11 people died. The Australian immigration minister, Chris Evans, told the Sydney Morning Herald he was "taking the claims very seriously". Evans has asked for more information about the process of detaining asylum seekers on the Pacific island of Nauru. The so-called Pacific solution was scrapped after the Labor prime minister, Kevin Rudd, came to power in December. The Edmund Rice Centre said other asylum seekers rejected under the policy had been forced into hiding in Pakistan and Afghanistan. Its investigation is featured in a documentary entitled A Well-Founded Fear to be broadcast next month. The documentary includes the story of Gholam Payador, who was sent back to Afghanistan in 2002. Payador holds up a photograph, taken on Nauru, of himself and two other people, both of whom are now dead, according to the Herald. The former immigration minister Philip Ruddock accepted mistakes may have been made. But he added: "The [UN] refugee convention does not say you cannot be returned to a dangerous place. "The fact that somebody might tragically die may well be as tragic as a road accident in Sydney." A CLAIM that up to 20 Afghans denied entry into Australia were later killed by the Taliban has sparked fresh calls for a royal commission into the treatment of asylum seekers and refugees. Edmund Rice Centre director Phil Glendenning says he has documented the deaths of nine of the Afghans, rejected under the Pacific Solution scheme, but believes the number is really 20. Mr Glendenning makes the claims in a new documentary, A Well-Founded Fear, to be aired on SBS television next month. Immigration Minister Chris Evans has asked the Department of Immigration and Citizenship (DIAC) for a full briefing on matters raised in the film. The Australian Greens today said the claims underlined the need for a royal commission. "The decisions made about immigration by the Howard Government have cost people's lives," Greens senator Sarah Hanson-Young said. "Now the Rudd Government has the chance to demonstrate the understanding, compassion and sense of justice that the Howard Government lacked so callously. "Immigration Minister Evans must demand the establishment of a royal commission into the way Australia's immigration policies have treated asylum seekers, as a matter of urgency." Senator Hanson-Young said only a royal commission would bring a complete picture of the damage caused by Australia's immigration policies. A spokesman for DIAC said the department takes seriously its obligations to asylum seekers, and does not return them to places where there is "a well-founded fear" of persecution. "The department is not responsible for all aspects of the future wellbeing of a person in their homeland," he said. About 400 Afghans detained on Nauru during the Howard Government's so-called Pacific Solution were returned to Afghanistan after having their asylum claims rejected. A former human rights commissioner has called for significant changes to the immigration system, including compensation for "victims" of mandatory detention and hostels for migrants and most asylum-seekers. Sev Ozdowski who prepared the ground-breaking report on children in immigration detention centres four years ago remains highly critical of the system. Immigration Minister Chris Evans said the Government was committed to rolling out more humane policies on the treatment of asylum-seekers. "In line with these commitments, the discredited Pacific solution and the punitive temporary protection visa regime have been dismantled and debunked," he said. "The Labor Party also went to the last election with a commitment to maintain a system of mandatory detention and the excision of certain places from the migration zone, and both commitments will be honoured. "Unauthorised boat arrivals will be processed at Christmas Island and will receive legal assistance and access to independent review of unfavourable decisions." But Dr Ozdowski said the Government should scrap offshore processing of people seeking protection, warning the country would create the "Indian Ocean solution with Christmas Island as its headquarters". "There is not much difference between Christmas Island and Nauru except the island is huge," according to Dr Ozdowski, who is now an adjunct professor at the University of Sydney's Centre for Peace and Conflict Studies. "It will have all the signs when people are locked up there as we've seen in Woomera. We'll have all kinds of unrest and mental trauma associated with it it's just the nature of the beast." The Government should also "remove other vestiges of indefinite, non-reviewable mandatory detention" so the system was in line with international human rights law. Senator Evans said he had already reviewed the files of people who had been in immigration detention for longer than two years in order to resolve their cases. Dr Ozdowski called for an inquiry into the role bureaucrats played in this "sorry saga". "I know it's a very radical proposal [but] I also believe there should be some identification of individual officers who were involved with day-to-day support of the system because simply where there were victims, there were perpetrators." Asylum-seekers who were lawfully detained under existing legislation should receive compensation for their pain and suffering. "My records documented, for example, cases where advice of mental health officials ... that somebody needed to be taken to hospital or that a child needs to be released because they can't be looked after in immigration detention were simply ignored not once, twice, 10 times but in one case we found 20 times," he said. "So they are people who were wrongfully kept in those conditions and because of that they lost their health and clearly they are entitled to compensation." Dr Ozdowski who came to Australia as a refugee 33 years ago said the Government should set-up hostel-style centres for migrants and most asylum-seekers. A former human rights commissioner says Immigration Department officials who breached human rights under the Howard government need to face disciplinary action. Cultural problems in the department were identified in several inquiries into detention conditions and illegal deportations. Dr Sev Ozdowski, who is now at the University of Western Sydney, says the politicians have left government but it is not known whether public servants who still deal with asylum seekers meet required ethical standards. "There was systemic problems and it's very difficult to put it under carpet and say 'now we provide better training for our officers and now the Government is telling us that we should behave better, so we are behaving better'," he said. "We won't fix it unless we address the issue." Dr Ozdowski told a parliamentary inquiry into immigration detention that the Government's move to make detention a last resort is welcome, but it needs to become law. He says assessments of staff over past wrongful detention or deportations would ensure Immigration Department culture does change. "I think they should be verified by the public service as to whether they are fit to serve in the Australian public service," he said. Dr Ozdowski says it would not be a witch-hunt, but it could change a culture where overzealous public servants did not provide fearless and unbiased advice to the Howard government.